Play I-Spy on Vacation and Photograph New & Interesting Wildlife that You Find? One of the things that we love to do is record & learn about the new wildlife that we see. Most of these are when we are on vacation. 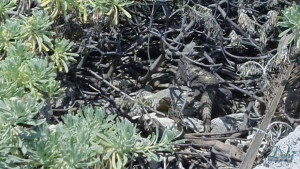 Can you find the iguana hiding in this bush? I remember the first time I saw an iguana. I thought they were so fun to watch. Then a friend of ours got one as a pet. He had it so tame it would ride on his shoulder. But of course he had obtained it as a baby. I was so intrigued with it that I had to have one. We had two iguanas as pets. We had Iggy that lived 13 years and the Paco that lived for 10 year. I could never believe how they would show their personality and they let you know what they wanted. Finding this iguana on our vacation isn’t new to us but iguanas will always be interesting to us. This one tried to hide camouflaged by the dark branches. I remember the first time we saw one and fell in love. Our iguana had a short nose and was bright green. If I find my pictures of Iggy or Paco I will post them. It was back in the day that I only had a Commodore computer and no scanner. A note of warning. A wild iguana can bite. We had one steal a sandwich out of our sons hand on a picnic at Tulum years ago. Iggy our iguana was territorial and got made at my husband for sleeping on the bed during the day. (His sleeping place during the day) and Grabbed onto his arm with his mouth. He didn’t let go. We had to pry his jaw open. He wasn’t hurt by my husband still has a scar. Iggy’s teeth were like razor blades. Always assume a wild animal is wild and unpredictable even when they appear docile or friendly. 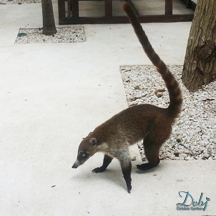 This cute animal is called a Coati. I loved this guy. He had a tail like a monkey, paws & a mask like a raccoon & a nose like an ant eater. He was looking for food that had been left by vacationers. We was very agile. He climbed trees and ran along the walls. We had a good time watching him. He finally found some french fries & then got lucky with a rib bone. Both of which he guarded from the birds and quickly devoured. We were careful to keep him away from our table where we ate. He was cute but wild animals are unpredictable and not worth taking a chance over. 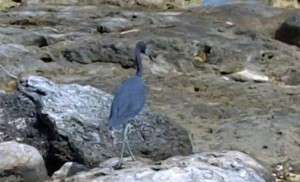 We saw a Mexico Blue Crane or Blue Heron on our walk along a rocky shore. 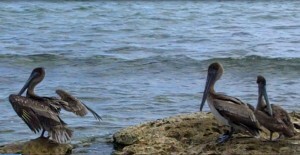 There were also a pod of pelicans. A pod is what a group of pelicans are called. I just learned that. Another little fact for your next trivia game. Decide? Which All Inclusive Vacation? 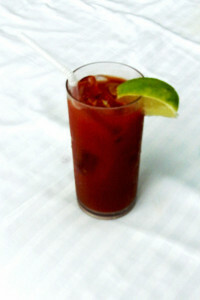 I am looking for an all inclusive vacation to the beach in Mexico. I do this every year sometimes twice a year. 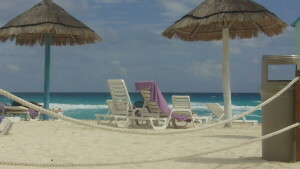 An all inclusive resort vacation on the beach in the Riviera Maya Mexico area is my ultimate vacation. 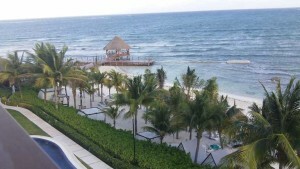 The picture above from our room where we stayed last year at the Secrets Silver Sands Resort Riviera Maya Mexico. It is beautiful and very high class. 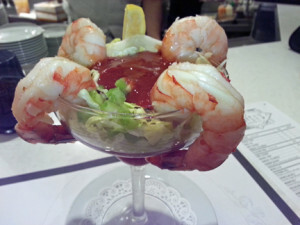 It had some of the most impressive restaurants of any all inclusive resort we have been to. 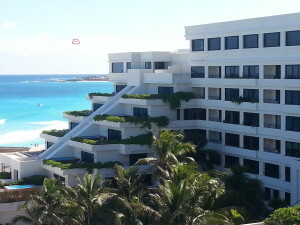 It also had the best ocean view room. But it was a bit over our price range this year. 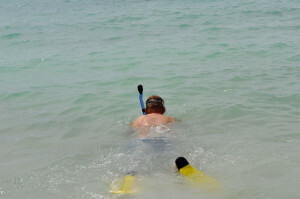 This year I look for all inclusive packages that included the room and all the taxes and fees with that go with that, included your food and drinks, several options for non-motorized water activities, taxes, gratuities, and the airfare with in our budgeted price range. That way I can book it and then forget about worrying about anything or paying for anything else. Is all that too much to ask? Well not for all resorts. I find so many that I have a difficult time deciding between them. The biggest problem I am having this year is finding a resort that has enough rooms available in the ocean view category for my entire group. There are 10 of us going together. It seems like that the Mexican Riviera All-Inclusive Resort Vacation has become very popular which makes it sell out quickly. Part of the reason for that is that there are more and more airlines that are now flying into Cancun. Well my search is on and I will let you know what happens. Do I find a resort worthy of my picky criteria? What is the lucky resort? Camping really??? My idea of camping is staying in a cabin at the very least. I love roasting hot dogs and marshmallows then heading indoors about the time the mosquitoes start biting. We went camping when we were first married. It was all really fun until it got dark and we got in the tent. Then I just knew there were things moving around in the dark outside and I didn’t trust the tent material to protect us. I felt like bait. I jumped and said “what was that” every couple minutes. I was terrified. About 2 o’clock in the morning my husband gave up, packed up and we went home. I think we only went camping in a tent a couple of times after that. We did have a camp trailer for a while too. Because let’s face it was the cheapest way to take a family vacation with kids. It was better in a camp trailer but still I didn’t sleep much. I can’t believe the things I did for my kids to have great experiences. I also have to agree with my husband that being out in the beauty of nature it is really soul filling. The funny thing my kids like to go camping. But for me I can’t do the tent camping. What funny experiences have you had?